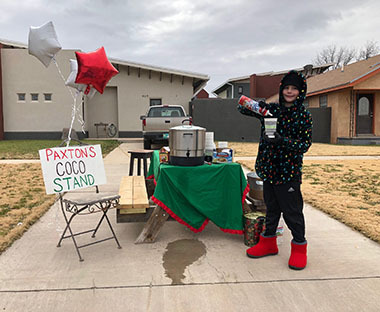 Eight-year-old Paxton Williams of Castle Rock, Colo., serves up a little holiday cheer this morning during his Third Annual Paxton’s Coco Stand. Williams began mixing up hot cocoa and good tidings to the people of Artesia during a Christmas visit to “Grandma’s house” three years ago when he was 5. He and his family were living in Georgia at the time; the family now resides in Colorado, and Paxton is determined to keep the Christmas spirit alive and well in front of Grandma’s house in the 500 block of West Quay Avenue. He will be outside this afternoon, tomorrow, and for many Christmases to come. Patrons to his stand will also receive a handmade Christmas ornament to hang on their trees.